Today, Happy Meal and I drove to Long Beach to meet Side Of Fries at the At Last Cafe. Side Of Fries had been hyping this joint for its quality of food and the fact that the burgers have always looked amazing. At Last Cafe was a cramped and bustling joint that seated about 26 people inside and out. It had two servers, neither of whom had any business being as bad as they were in the middle of this, the Great Recession. At last someone has wiped the syrup and grease off of my table. At last someone has found me some clean silverware. At last someone has provided me with the napkins that I asked for three times. At last someone has someone has brought the check to the table. At last someone has brought the lemon slice that I requested four times....wait....no, that never showed up...sigh. OK, you probably got it--the service was abysmal. The Beef: 80/20, well-aged, finely ground Chuck. It was probably more like 75/25, because it was ridiculously oily. It was like eating a puck of bland, bacon drippings on a bun--utterly miserable. The Seasoning: There was a hint of salt on the exterior, but there was not a trace of seasoning inside the THICK, 1/2 pound patty. The Sear: They gave it a hell of a try, but the grind was so fine that the juices of the burger leaked copiously as the patty cooked, so the sear was made rubbery and bland by the boiling liquid in the pan. The Preparation: The thick patty was loosely packed and pan seared to a perfect Med Rare. 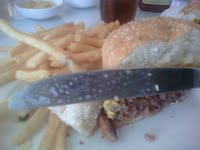 The thickness of the patty and the fine grind is where this went wrong. The exterior of the patty was flavorful, and the fat rendered out so that it was palatable--at least the outer 1/8 inch of the burger. The interior was more or less a fine grained, oil slicked beach and completely inedible. It was like BP had their way with my food. The Bun: WEAKLY toasted, standard hamburger bun, which was cool and clammy on the inside. GROSS. This cooled the cheese and was just downright nasty on the tongue--pasty and cool. It appeared that they had stored the buns in the refrigerator--a weak move. The Cheese: 50 cents extra for a slice of American Cheese--dicks. It was already a $13 burger. 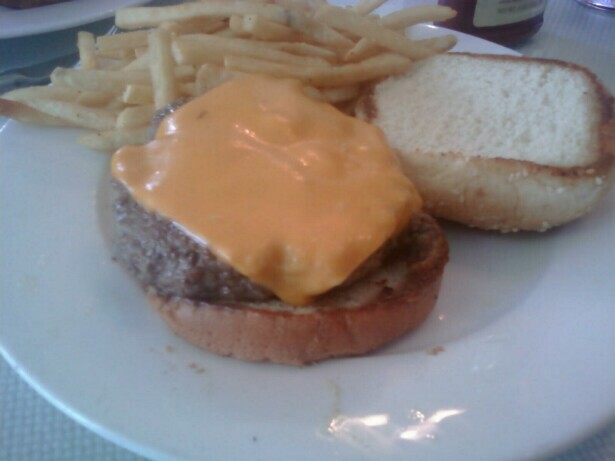 They managed to melt the cheese, but the cold bun cooled it off and that was that. The Value: The value was poor, since the burger was too greasy to finish. 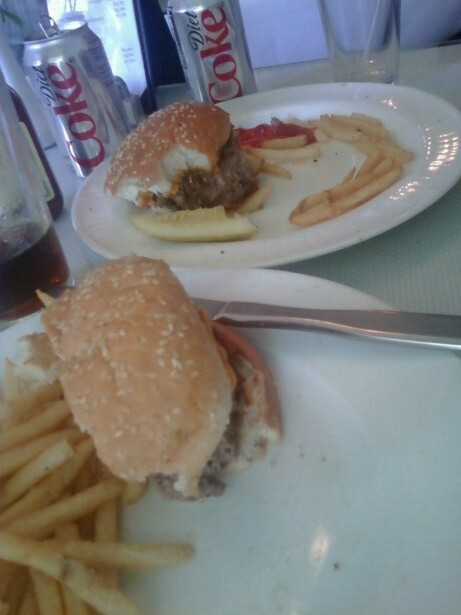 Not a single one of us was able to finish these awful, grease sponges. Naturally, the servers failed to note it as a bad sign that we were leaving half of the food on our plates and that we turned down the offer of carryout boxes. I did not want to carry this home--I didn't have the correct permits to turn my car into a tallow tanker. The At Last Cafe cheeseburger would be great for anyone on a diet. 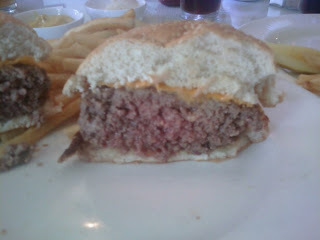 You would spend your food budget on this burger and then throw it away--presto...no calories ingested. Burger Review : I would not eat this again on a dare.